This is one of a number of books in which Clark Pinnock is involved in questioning orthodox Christianity. His denial of hell as a literal place of torment is well known. 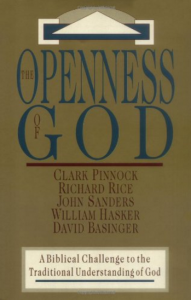 In this book (first printed in 1994 by IVP) Pinnock and others (Richard Rice, John Sanders, William Hasker, David Basinger) challenge the “traditional” view of God by presenting an “open” view of God. Their basic proposition is that if man truly has free will, then God cannot know for sure what he (man) will choose to do at a future time. Basinger writes, “God, we acknowledge, does know all that has occurred in the past and is occurring now. Moreover, God does know all that will follow deterministically from what has occurred, and can, as the ultimate psychoanalyst, predict with great accuracy whether a couple would have a successful marriage. But since we believe that God can know only what can be known and that what humans will freely do in the future cannot be known beforehand, we believe that God can never know with certainty what will happen in any context involving freedom of choice” (p. 163). This, of course, has dramatic influence on one’s view of prophecy, inspiration, foreknowledge and sovereignty. The authors separate themselves from the view of “middle knowledge” and therefore from some earlier contributors. This is becoming a newer form of liberalism for a new century!